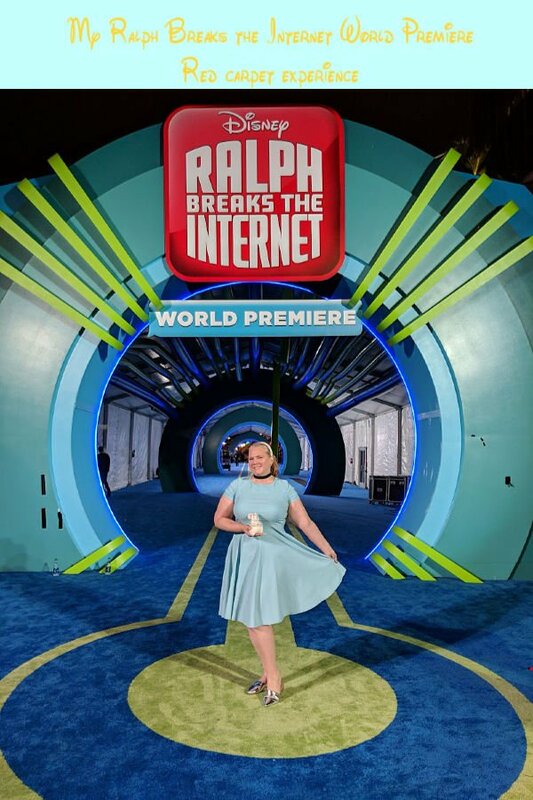 Yep, that’s me on the “Red Carpet” of the RALPH BREAKS THE INTERNET World Premiere! I know, I know, you’re thinking two things: 1. That’s not you, that’s the real Cinderella and 2. The carpet is blue and gold. Thanks, but though I am a princess, I’m just dressed as Cinderella. Don’t you adore my mouse? And, I loved the color of this “Red Carpet”! I think my dress looked adorable with the blue and yellow! It’s as if they planned it…no, they didn’t call me ahead of time. 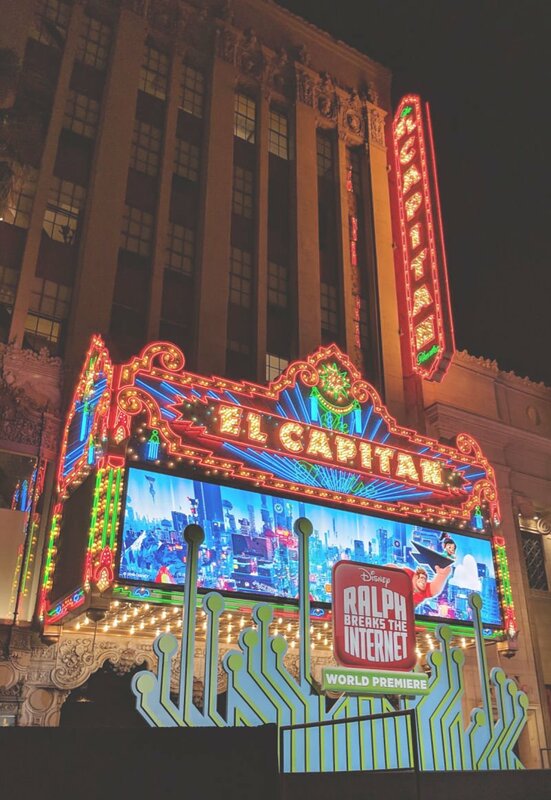 The World Premiere for RALPH BREAKS THE INTERNET was at the gorgeous El Capitan Theatre in Hollywood, California. 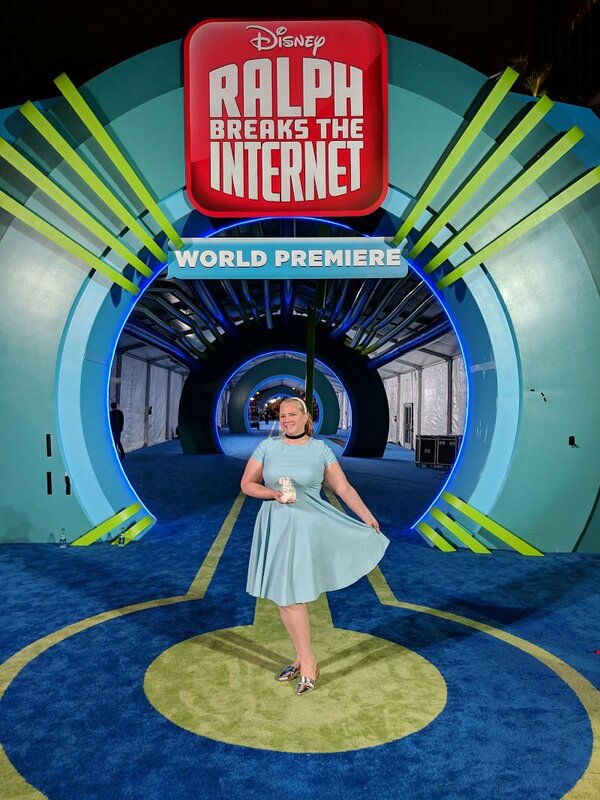 This was my second Red Carpet experience. My first was for THOR: RAGNAROK, and though it was breathtaking and amazing, I love that I got a better picture of me ON IT this time. 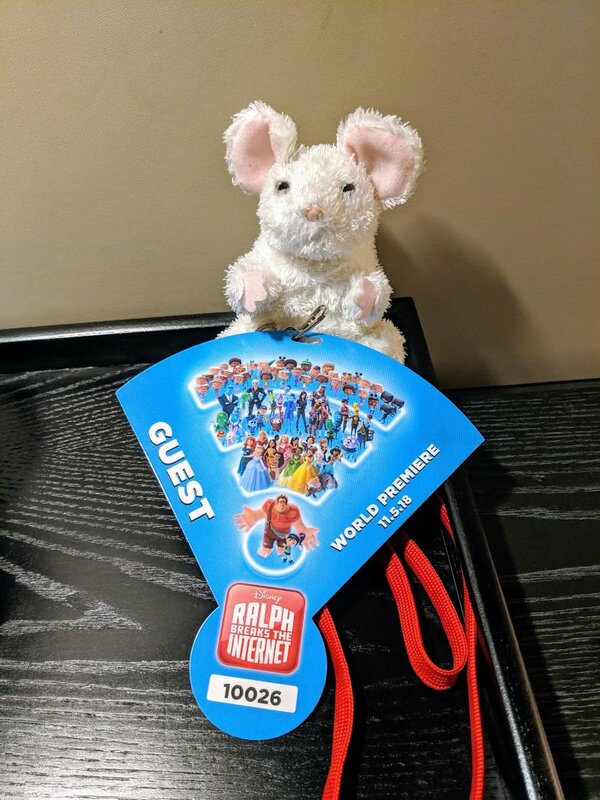 I also love how this tunnel is very representative of Ralph and Vanellope’s trip to the internet. If you’ve seen the trailer, you’ve seen them rushing along the wires to the internet. If you haven’t, watch it below! 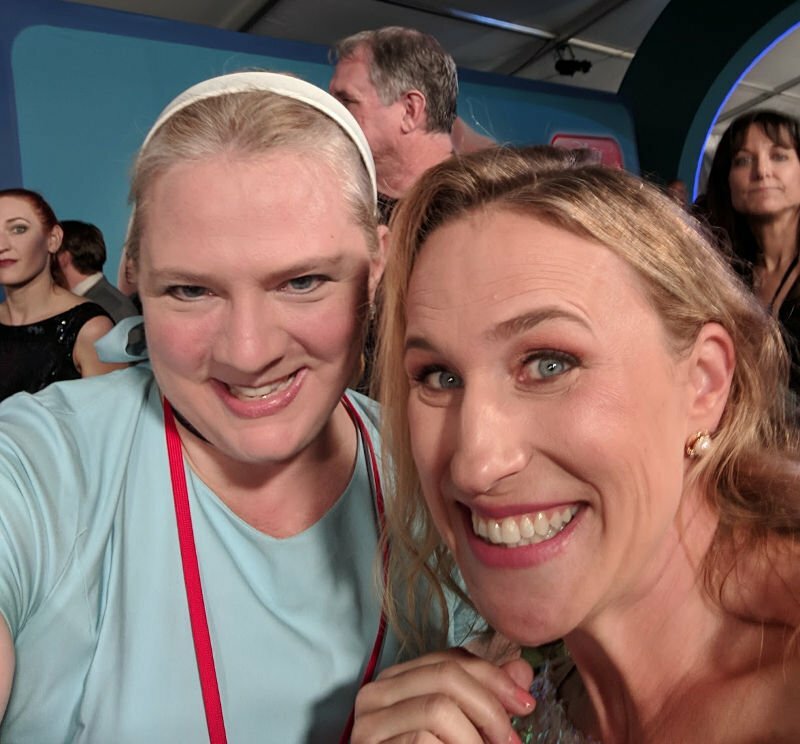 While on the red carpet, Co-writer Pamela Ribon walked by, and since she’d met us the day before, she was all excited to see us dressed up for the premiere. She loved my Cinderella look. I’m not sure what’s up with my creepy look, but just pretend I don’t look like I’m scheming to lose my glass slipper at midnight. I thought this photo op prop was so cute! 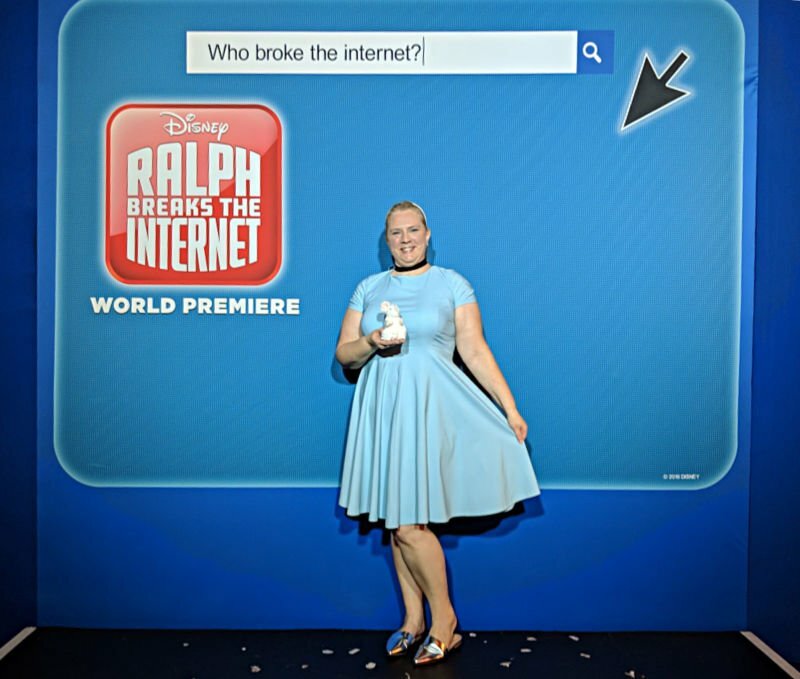 I promise, I didn’t break the internet…not in a bad way, at least. I’m gonna break it in a good way with my Cinderella awesomeness! 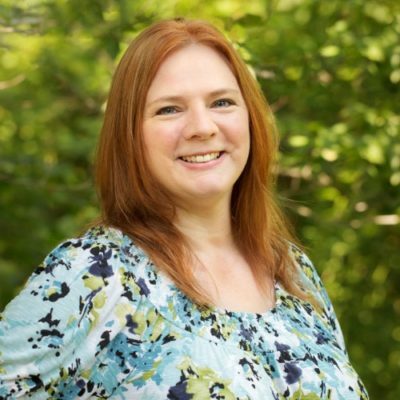 Thanks, Louise at Mom Start, for making sure all of the words were in my pictures! One of the best parts of being on the red carpet is sharing the experience with your friends. I love that my blog friends were there to help me get some super shots! Like the fans we are, capturing pictures of celebrities on the red carpet is one of the most exciting parts of walking the red carpet. 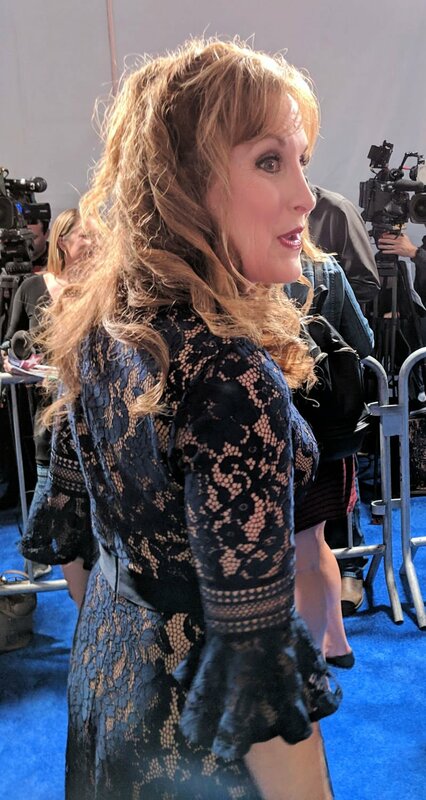 It was super exciting to see Jodi Benson, the voice of Ariel. 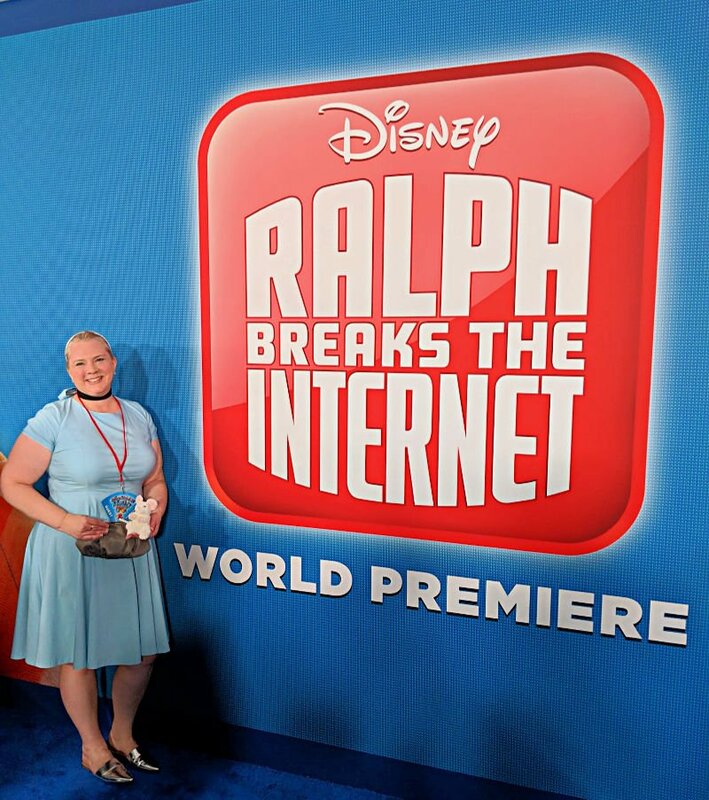 I didn’t see all of the princesses that were at the premiere, but I did get to see Paige O’Hara too. I wish I had gotten a picture with her because Belle is one of my daughter’s very favorite princesses. She’s a bookworm too! 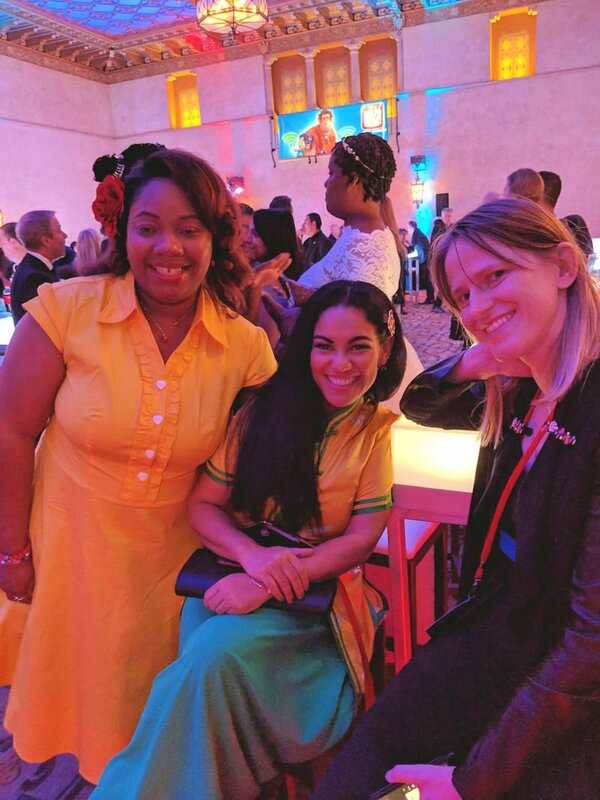 I did see Linda Larkin and Auli’i Cravalho at the after party, and that was a lot of fun. Several of these Disney princesses are the voices my daughter grew up with, and they hold a special place in my heart. But, I have to admit, there was one selfie I had really hoped to get, and I did! 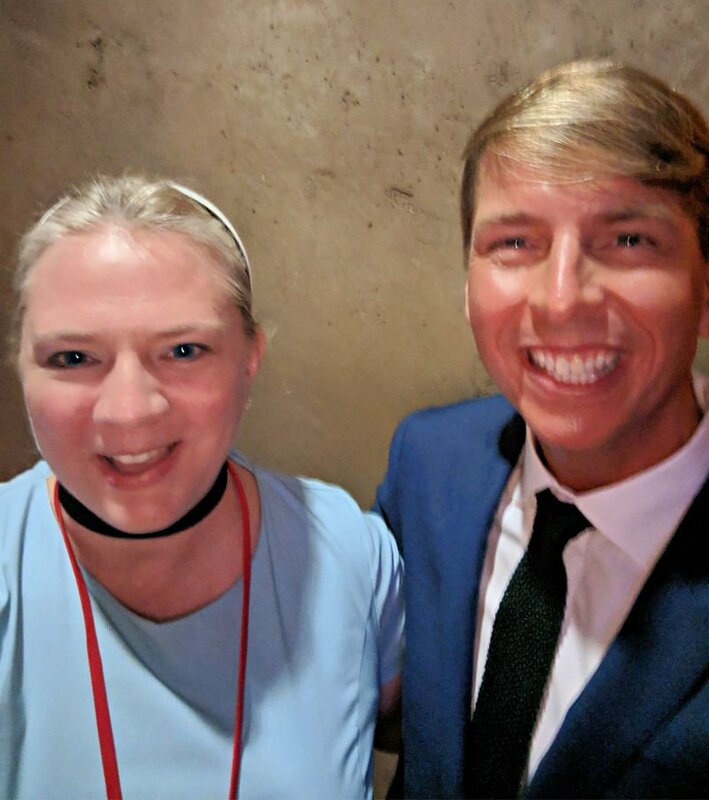 I got a picture with Jack McBrayer! THE MIDDLE was one of my favorite shows, and I knew he’d probably be there since he IS Fix-It Felix! He was so nice which is the most important qualities anyone can have. 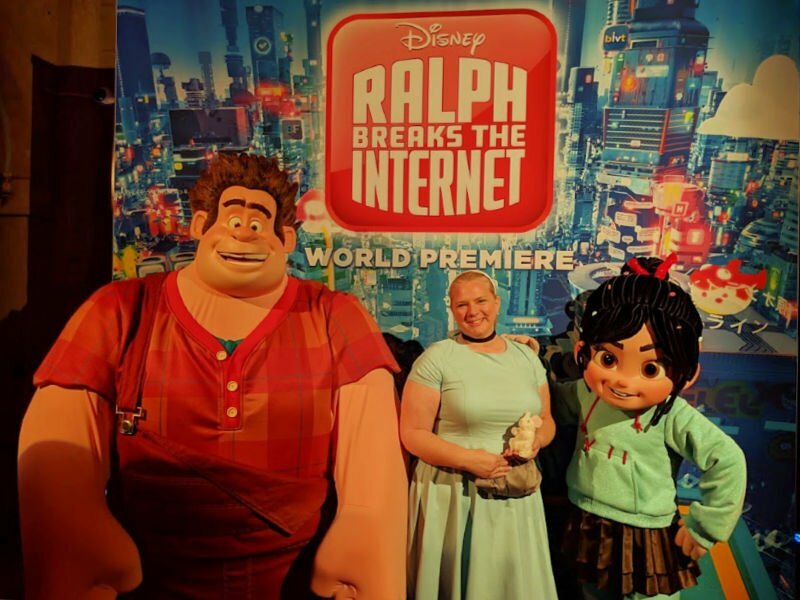 Ralph and Vanellope were at the after party for a fun photo op! I think they really liked my mouse. Being with blog friends, who become real friends, at the after party was definitely the best part (well, next to my Jack experience). Nickida, Elayna, and Louise looked lovely and are just as lovely on the inside! Nickida was Belle, Elayna was Mulan, and Louise was Vanellope. 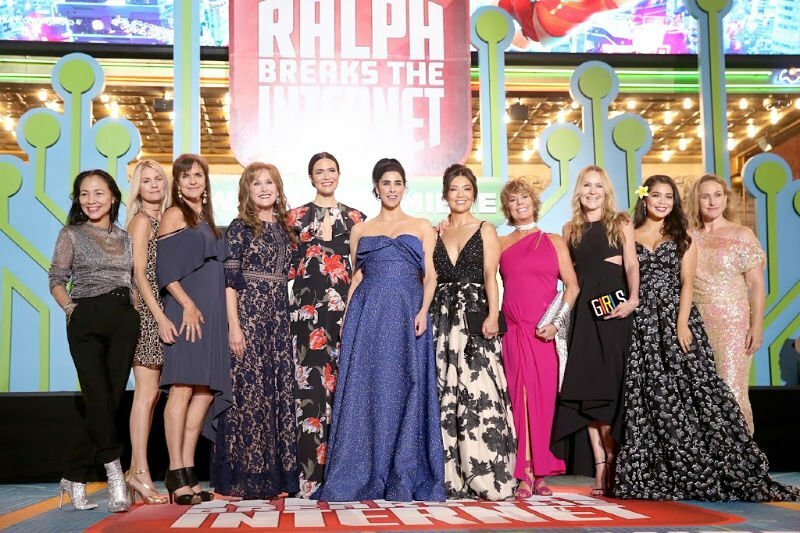 The RALPH BREAKS THE INTERNET World Premiere was such a fun experience with great food and friends. It will be a memory I always cherish. you looked stunning, I just adore your shoes!! Looks like a fun night, but it’s no surprise Wreck it Ralph was an amazing movie, so its sequel has to be the same! What fun! My son wants to see this movie.